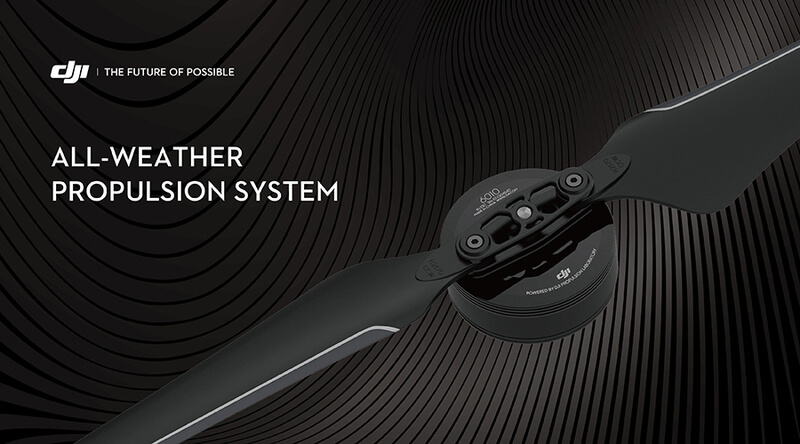 We are delighted to present the new DJI E2000 – our first Tuned Propulsion System designed for all-weather use in industrial applications and film making. Using a combination of 6010 motors, 1240S/X Field Oriented Control ESCs, and 2170 propellers, the E2000 is designed to carry payloads of 1800 g–2500 g per axis, with a maximum thrust of up to 5100 g/rotor (50V, sea level), giving it the power to handle add-ons including computing devices and advanced imaging equipment. The 6010 motor’s bearings are fully sealed to prevent fluids such as salt water from causing corrosion. A special surface coating applied to the stator also greatly improves its ability to withstand rusting. And the E2000 Standard has an IP56 rating. To more effectively dissipate heat generated under intensive industrial use, the 6010 motor features an integrated centrifugal cooling system that effectively cools the motor while keeping dust and micro particles out. The 1240S FOC ESC is equipped with a silica thermal pad and heat sink for maximum heat transfer and dissipation. The E2000 is available in Standard and Pro versions to meet the demands of professional and industry users. Whether your business requires modular capabilities or a tightly integrated system, the E2000 is the perfect propulsion system to serve as a foundation for your aerial system. For customized solutions for industrial use, please contact info.industry@dji.com. The E2000 Pro will be released shortly.